I don’t know many people that don’t like pizza! Sunday’s are usually a perfect day for a pizza party, and Sunday pizza making has become somewhat of a tradition. I love buying dough and fresh mozzarella from my local pizzeria. The owner has come to expect me to walk through his doors, and I look forward to our catch up conversations. Pizza Sunday’s are pretty great, because we can never finish a whole pizza in one sitting, so there are always leftovers for Monday’s lunch. Monday’s are that much better because of it! The dough usually takes on some really odd vegetable combinations, all dependent on what lives in my fridge. 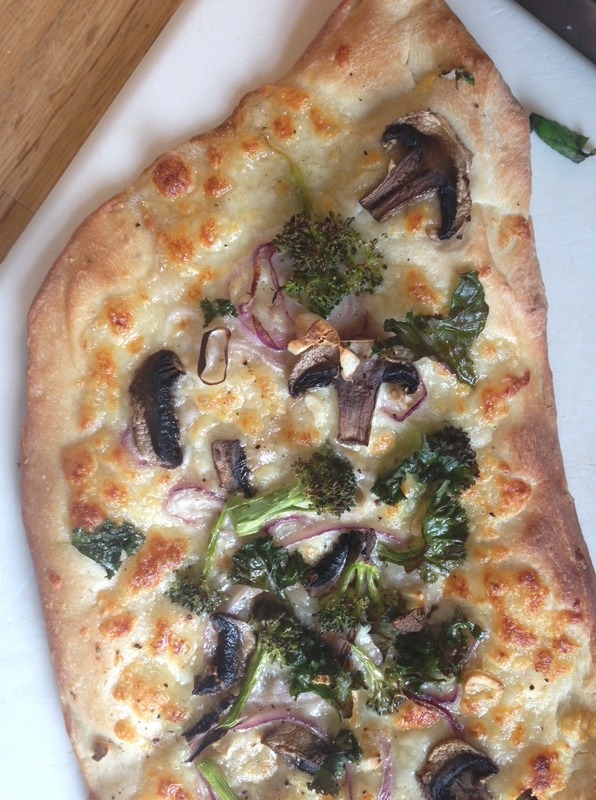 Last Sunday I made a Brassica pizza, featuring some curly leaf kale, broccoli and some other non-Brassica’s, for a multi-cultural veggie pizza experience. 1. Prep the dough: Preheat your oven to 400F (gas stove) 450F (electric stove). I like to cut the dough in half (totally optional), since I have a cast iron skillet that I like to use, and a smaller piece of dough fits much better. You are welcome to use a pizza stone, or any other baking sheet that you like. If using cast iron or a baking sheet, add a dab of olive oil and spread across the surface. Stretch the dough out with your fist so it expands and gets thinner. Fit the dough to your baking surface. 2. Prep your ingredients: Rinse and slice your mushrooms, slice your onion, rinse your kale and broccoli, chopping appropriately. In a bowl add a drizzle of olive oil to your kale, and a small pinch of salt. Massage the olive oil in, then set aside. 3. Assemble the pizza: Shred your mozzarella first, sprinkle some sea salt and grinds of pepper. Add on your onions, mushrooms and top with your broccoli. Save your kale for 10-12 minutes before the pizza is done cooking, to create a kale chip topping. 4. Cook the pizza: Cook for 20-25 minutes total, depending on your oven’s strength. Midway take a peak, see how it’s doing, hang around the kitchen. Shake the pan a bit so the dough loosens and doesn’t stick. 10-12 minutes before the pizza is cooked, add on your kale. Remove pizza once dough is cooked through, and kale is crispy.